I’m actually hedging with this one a little bit because this corn isn’t actually “fried”. What it is is deeply sauteed in olive oil and butter. Is is so wrong??? 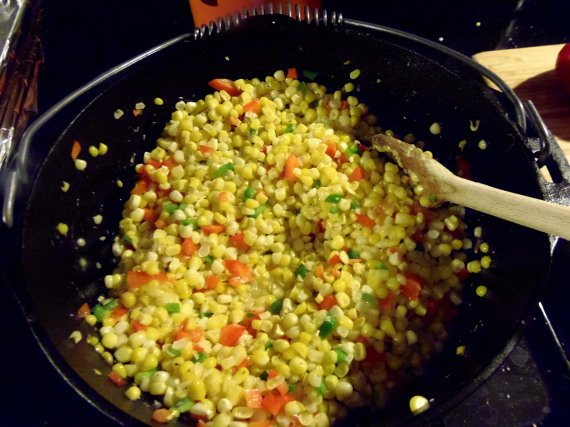 Fresh corn is chopped right off the cob and sauteed together with diced sweet and pungent red and green bell peppers. You get all the summertime freshness of everyone’s favorite veggie, corn on the cob, but none of the stick between your teeth, somebody hand me a toothpick, annoyance of biting those little golden kernels directly off the cob. 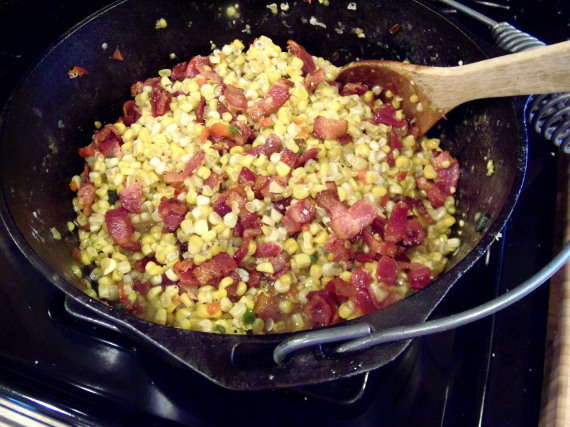 Add in the sauteed bacon and you have yourself an amazing side dish that will thrill the masses. 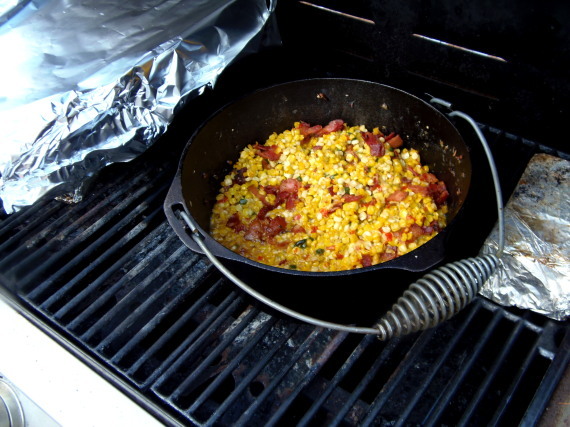 -Add the olive oil and 2 tablespoons of the butter into the corn and cook over medium/high heat for about 5 minutes. -Add in the diced bell peppers and the garlic. Stir and continue to cook over medium/high heat for an additional 5 or so minutes, stirring occasionally. -Add in the cooked and crumbled bacon and the salt and pepper. -Add in the remaining butter and decrease the heat to medium/low for approximately 3-5 minutes. *Note – I was making this for a crowd and so I made it in advance and refrigerated it until it was time to reheat and serve. Once ready to serve, I added it directly to the grill to reheat on medium/low until it was heated through, approximately 10-12 minutes, stirring occasionally. Sadly I don’t have any beauty shots of this dish on it’s completion other than the one on the grill. As I said, we were entertaining at the time and when it was ready, I forgot to take pictures. Shame, shame. Corny? You bet! But completely delicious too!!! I bet this went over great with your guests! Great recipe idea Renee. Love this, corn is my favorite. 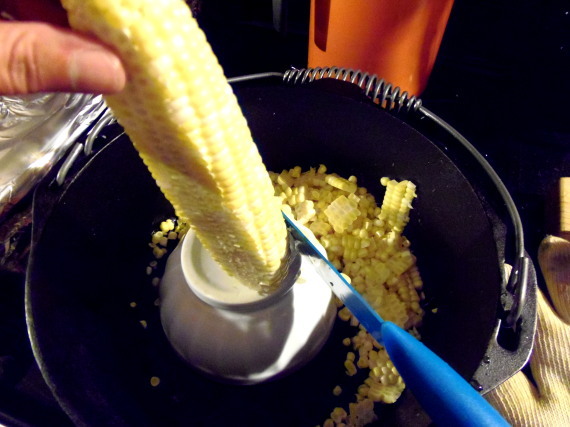 I have to use your method to de kernel the corn, Brilliant. It seems I've been cutting a lot of corn off the cob and I love your little cup trick! I can see it would really help. Now I want to go get some corn! We love fried corn! I'll have to try it with bacon now.